Ever feel like wearing a LEGO necklace? If you ask my 6-year-old daughter Natalie that question she’ll answer, YES! These special necklaces are so fun and easy to make. 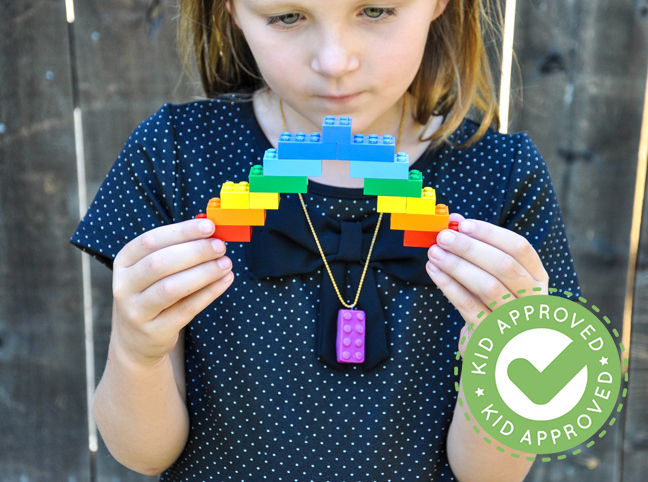 Natalie decided to make her necklace with a magenta LEGO brick — she’s obsessed with magenta — and we were able to make it in just a few hours (including prep and baking time). She’s been wearing her necklace ever since. Try this DIY as a playdate project, or an activity during a LEGO-theme birthday party! Step 1: Tear off a LEGO-size chunk of the mold maker clay. Step 2: Chose a LEGO brick. Dust the outside of it with a bit of cornstarch to prevent sticking. 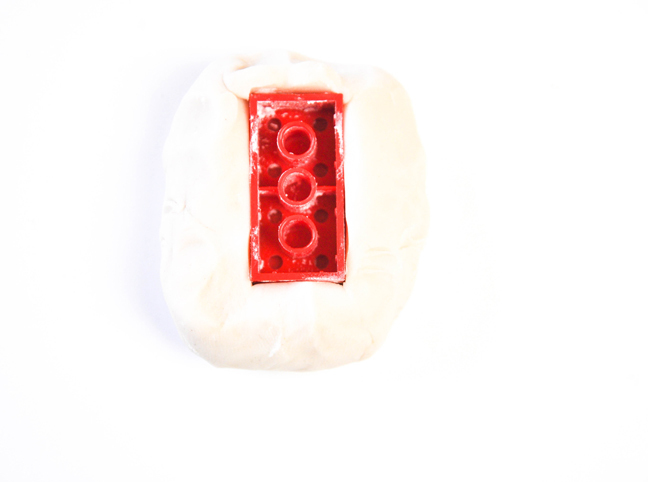 Step 3: After preparing the clay by kneading, push the LEGO brick into the clay to form the mold. Step 4: Release the LEGO brick from the mold and bake at 275 degrees F for an hour. Step 5. Allow the mold to cool in the pan for about 30 minutes. The mold will be set, but still be pliable. Step 6: Take your prepared (kneaded) polymer clay in your choice of color and press it into the mold. Make sure to press firmly down, so that the clay will enter all the nooks and crannies of the mold. Step 7: Release the clay form the mold (this is where the pliability of the mold comes in handy, so you can work it out) and insert the eye pin into the top of the clay, orienting the pin so that when the necklace is strung through the hole, the LEGO brick will be straight. Place into the oven face up for 40 minutes at 275 degrees F.
Now string it on your munchkin and watch him or her get excited about LEGO bricks!